The current exhibit at the Cape Cod Museum of Art includes items from the WHOI Data Library and Archives. The exhibit, "Mysteries & Revelations: Discovering Cape Cod's Museum Treasures," focuses on items with previously unknown stories behind them, held by 36 art, science and history organizations on the Cape. 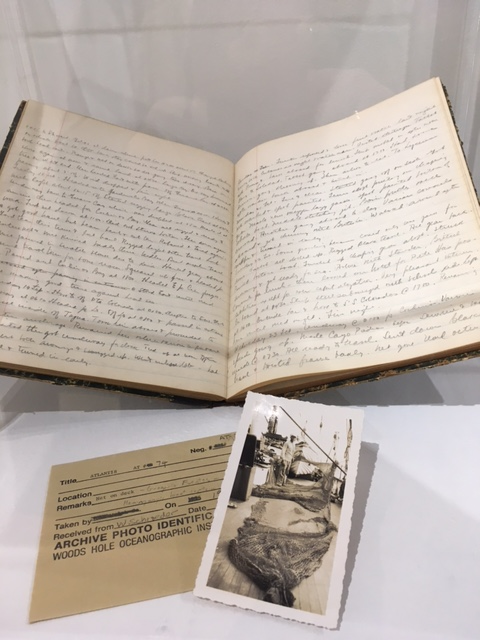 The Data Library's addition to the exhibition includes two items related to a photograph of Gregorio Fuentes, who was Ernest Hemingway's first mate on his boat, El Pilar, and was one of the inspirations for the Old Man and the Sea. Fuentes worked on WHOI's vessel, the Atlantis, during a cruise that circumnavigated Cuba in 1938 collecting fish samples. A reference request at the Data Library led to the discovery of Fuentes' time on the Atlantis. The exhibition runs until November 26 at the Cape Cod Museum of Art at 60 Hope Lane in Dennnis, MA.